I denne Engelsk Opgave overvejer jeg og diskuterer hvad skole er for mig. 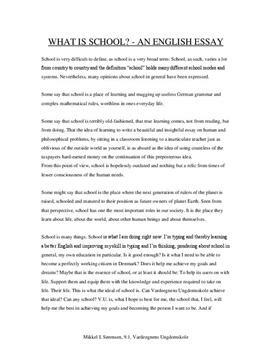 "School is very difficult to define, as school is a very broad term: School, as such, varies a lot from country to country and the definition “school” holds many different school modes and systems. Nevertheless, many opinions about school in general have been expressed.